Copify is a copywriting service website that hires Freelance writers from the US, UK, Australia and Canada. Based out of the United Kingdom, Copify claims to only hire skilled writers to provide services to a variety of markets and niches. From blog writing, product descriptions to SEO articles- Copify offers a lot to their clients and therefore need a variety of skilled writers to work on a freelance basis. 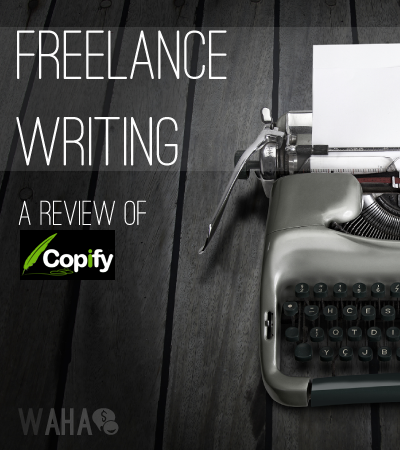 Does Copify Hire New Freelance Writers? Yes! But, you must be a skilled writer. While Copify does not have a set-in-stone list of requirements to qualify as a freelance writer, they are interested in people who have specialized training through courses or degrees in the field of writing or journalism. Experience as a writer is, of course, going to help you reach the skill level expected by Copify. According to the company, about 40% of applicants are approved. Copify posts available assignments and eligible writers can choose to accept them. There is no bidding required and projects are not automatically assigned. However, if you do great with a client, there is potential for them to request more work done from you through Direct Orders. How Much Does Copify Pay Writers? Each assignment will have the payment for the project listed alongside it. Copify says articles sometimes pay as much as $30 for 500 words. However, I have had no luck finding verification of a common pay range from actual freelance writers. Copify pays every day through PayPal. Once you accept and submit an article, the funds are added to your account after the client approves the project. You can then request payment. Copify says they make one daily mass payment to everyone who has requested their balance to be withdrawn. The mass payment is sent at 14:00 GMT, or 9 AM Eastern (I had to Google It). Copify asks all applicants to create a profile page and submit a CV. Not sure what a CV is? It’s not the same as a resume- like I originally thought. In addition to the CV, Copify would like to see a sample of your work. The sample must be at least 200 words long. Don’t be afraid to be creative with your sample piece. Copify lists some qualities of a good writing sample on their FAQ page. The list includes the obvious, proper English and grammar, good structure that includes subheadings with a beginning, middle and end as well as being imaginative, engaging and interesting. Is Copify Currently Hiring Freelance Writers? That can be hard to say. I did some digging around on sites like WAHM.com where I found confirmation that some people are/were working for Copify. However, there were also others who said they applied and never heard anything back from Copify. Any responsible writing company is going to do their best to not have too large of a pool of writers. My guess would be that your experience, interests and skill level will determine if there is a place for you at Copify. Just don’t expect an immediate response, if any. Copify does appear to be accepting applications. I took a chance and submitted a sample for this website. I heard back in a few days and started out as a standard writer. This allows me to get a pay rate of $10 per 350 words and after 10 articles has been rated positively I am eligible for an increase in pay. I am new to writing copywriting content so I felt this would be a great place to get experience before I start chasing higher paying clients. There system is very easy to use but at my level it does not seem to be much work available or I am just missing it. Don’t they take 67% of your earnings from the client? I have heard nothing but negative things about copify. how can I earn on this platform? From time-to-time, yes. I post in the job board when I need to add to my writers group.